January 11, 2018, 11:16 a.m. The number of Brits saying that health is one of the most important issues facing the country has hit an all-time high of 53%, new YouGov data shows. It is the highest the issue has scored since YouGov began regularly conducting issues-tracking polls in 2010. The results comes amid headlines of a winter crisis in the NHS and some health bosses saying the service is at “bursting point”. 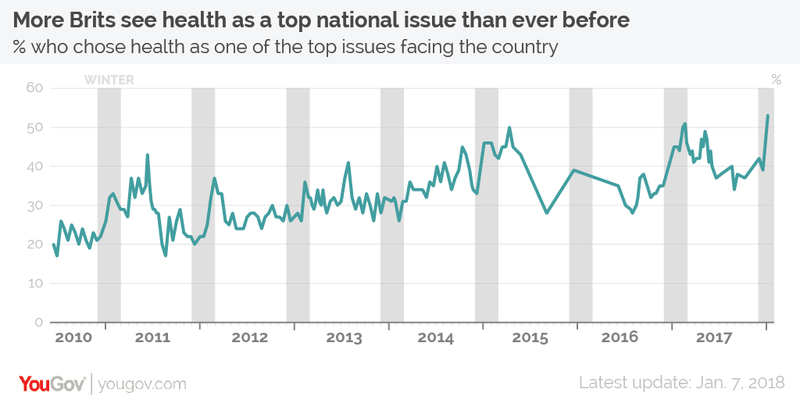 The last few weeks have seen a dramatic spike in the number of people selecting health as one of up to three top issues facing the country, with the figure up 14 percentage points from 39% in the middle of December. Nevertheless, the issue still trails Brexit, which 60% picked as a top issue. It is not unusual for health to become a bigger issue during the winter months, as the cold weather takes its toll on the public’s health. However, the current shift has been more dramatic than we have seen in previous years. This winter&apos;s increase is not restricted to supporters of any particular political party. 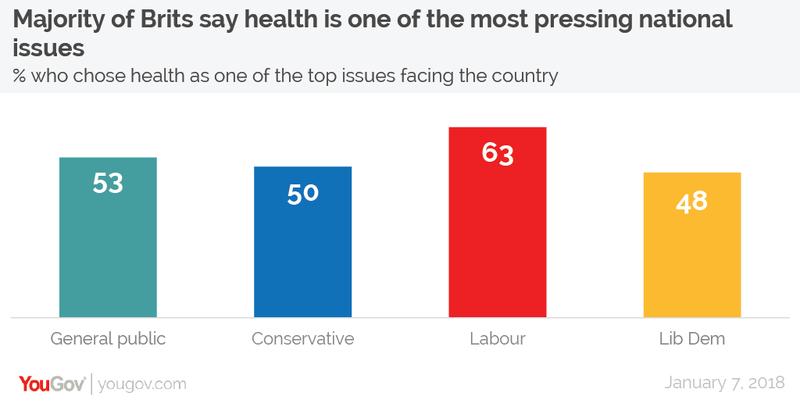 The data shows that half (50%) of Conservative voters and approaching to two-thirds (63%) of Labour voters currently see health as a top issue (up 15 percentage points and 12 percentage points respectively since December). Older people are more likely than younger people to see the issue as important, although this may not be surprising given older Britons are more likely to be frequent users of health services and are more vulnerable to ill health in the winter. Nevertheless, young and old both still consider health the second most important issue facing the country (again, after Brexit) at 47% of 18-24 year olds and 58% of the over-65s. Who does the public trust to fix the NHS crisis? One factor that has remained reasonably consistent is who the public thinks would best handle the problem. Approaching four in ten Brits (37%) think Labour is the party best placed to manage the NHS, almost double the proportion who back the Conservatives (19%). This potentially makes this a key area for Labour to capitalise on in the coming weeks. However, if this is Labour&apos;s ambition then the party&apos;s leadership still has work to do. 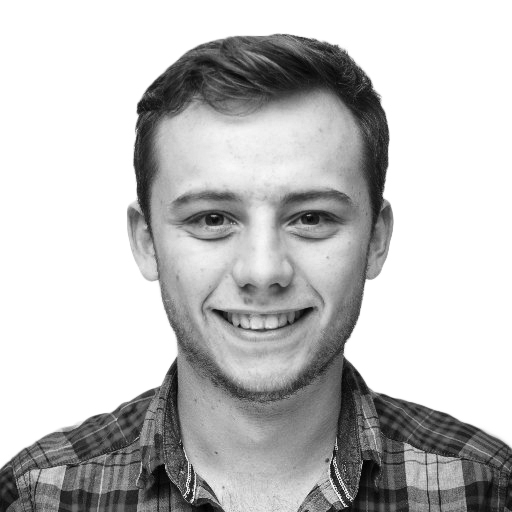 This week’s polling has Labour on 41%, just one point ahead of the Conservatives on 40%. This is almost completely unchanged from the two point lead the party had in mid-December before the spike.